In his travels across the Seven Seas, the Cap’n sometimes comes across really interesting swashbucklers. Just recently he met a buccaneer by the name of Kellen Roggenbuck who is not only an author and illustrator of children’s books, but also a beard aficionado. Kellen is right now a bit landlocked in Wisconsin (no, lads, Lake Superior doesn’t count as a mighty sea) where he lives with his wife Lindsay and son Levi. He’s dedicated himself to help families celebrate the beards in their midst. His first book “My Dad has a Beard” arrived as a message in a bottle two years ago. And his second book “Great Beards of History!” has just made landfall. The Cap’n took time out of his busy day maraudin’, carousin’ and drinkin’ to speak to Kellen. Cap’n: Tell us a little bit about your background. Be ye a writer by trade? Kellen: I’m not a writer by trade, no. I’ve always enjoyed creative writing, but I’m a pastor by trade. So, I do some writing as part of my job, but nothing really like a children’s book about beards. That’s all extra-curricular. Cap’n: I’m guessing the inspiration for your books was having an inquisitive kid? 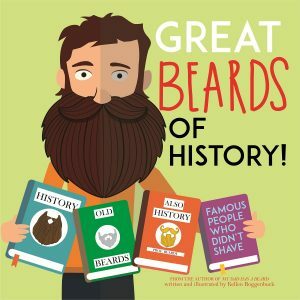 Kellen: The inspiration for Great Beards of History was the need for a follow up of my first childrens’ book My Dad Has a Beard. My son as a baby was always petting and gripping my beard when I held him, and it inspired the first book. Now, as an almost 4-year-old, my son’s learning so much. 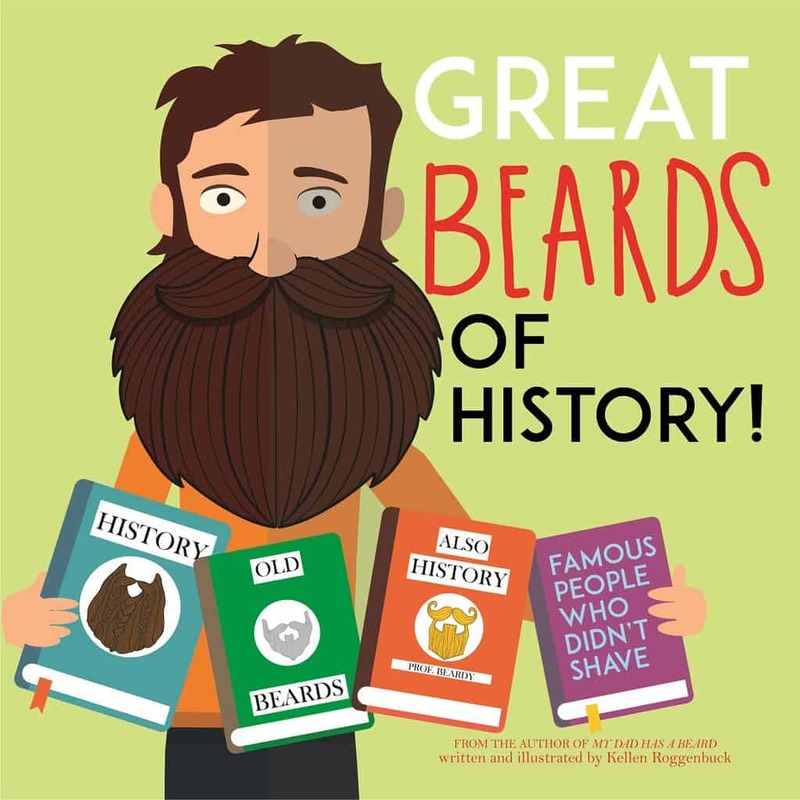 A silly book about history and beards was what I came up with. Cap’n: Love the art style. Who did the art? Kellen: I actually illustrated the book myself. Art has always been a hobby of mine and illustrating a book for my son seemed like a cool project. It turned out great, and I’m proud to share it with bearded dads. Cap’n: We be partial to Dav Pilkey (Captain Underpants), Cressida Cowell (How to Train Your Dragon) over here, and of course Henry Allard and James Marshall (The Stupids.) Do ye have any children’s book authors who ye found inspirational? Kellen: My son’s young enough that we do mainly picture books, but the ones I adore are ones that entertain my son as well as me. Dragons Love Tacos and The Day the Crayons Quit were the first we got in the house that just tickled me. Mo Willems has several that are quirky and fun, too, that really inspire me to try something different than your average kid’s book. Cap’n: What’s yer goal for these books? Kellen: Really, I love that they are dad books and especially bearded dad books. My goal would be that people would read my books, laugh with their kids and enjoy beards. Cap’n: Any advice ye’d like to share for bearded dads with kids who treat their beards like a swing set? Kellen: If your kid is using your beard as a swing set, make sure it’s thick handfuls so the loss of hair is minimal. Whisky takes the edge off. Also, never actually do that. Cap’n: And final thoughts, words of wisdom or advice ye’d like to share? Kellen: Writing books is fun, you should totally try. Grow a big beard, love your kids, buy my books and use good product in your beard. It makes a difference. If ye have little pirates at home, it’s important that ye teach them about the awesomeness of the bearded life early on.